The dog days of summer have arrived—running from July 3 to Aug. 11, according to the Old Farmer's Almanac. The 40-day stretch typically coincides with the hottest days of the year. Perfect for sitting by the pool, lake or ocean. 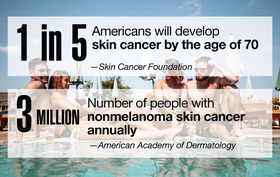 But don't forget that sunscreen, or better yet, head-to-toe UV-blocking swimwear. Download the PDF.